Son: I told you it’s the starter. Father: Yeah!! Last time it was the choke. This flickering tube light is really getting on my nerves. I am sure many of us will relate to this conversation. Whenever a Fluorescent tube light (FTL) starts to flicker, fails to light up or begins to lose brightness, we instantly start blaming the choke or the starter to be the culprit. Fluorescent tube lights have been around for decades and so has been the problem of irritating flicker. Yes, there is. The answer to the age-old problem of flickering tube lights is LED Batten which in comparison to the former offers high lumen efficacy with huge energy and cost savings. Take for example Orient LED Battens which come without any choke or starter and resolve the age-old problem of flickering tube lights. While we have progressively moved from CFL bulbs to LED bulbs but the transition from conventional tube lights to new-age LED battens is slow at the moment. Having said that, we will see the adoption rate increasing fast in the next couple of years backed by policy push and increasing consumer awareness. Now, let’s take a look at what we can achieve by replacing inefficient fluorescent tube lights with LED Battens. Replacing just one inefficient 40-watt conventional tube light (average usage of 10 hours daily) with an 18-watt Orient LED batten gives an annual saving of about Rs. 480* while also saving 80 kWh of annual energy and reducing annual CO2 emissions by 0.03 tons. With a modest assumption, if all 24.8 crore households in India use two LED battens for a year, there will be annual cost saving of approx. Rs. 24000 crore and annual energy saving of about 4000 crore kWh. Click here to check how much you can save using our Energy Calculator. Orient LED Battens have high luminous efficacy with a longer lifespan of more than 20,000 hours. They come with non-yellowing diffuser that ensures constant light dispersion throughout the life of the product. The use of high-grade polycarbonate co-extrusion accounts for durability, better aesthetics and long life. 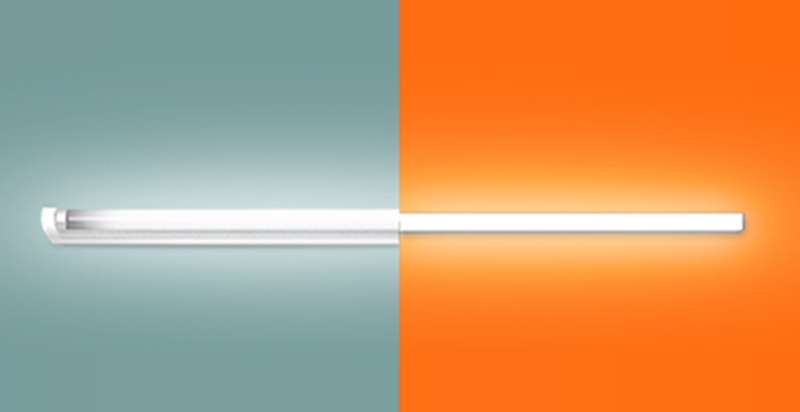 Orient Electric’s new range of LED Battens (5, 10, 18, 20 and 22 watt) is available in 1ft, 2ft and 4ft variants. Combining energy efficiency and reliability with decorative slim design and ease of installation, Orient LED Battens are an ideal replacement for conventional tube lights (T12/T8/T5) in both residential as well as commercial spaces. Now when you know the benefits of LED battens, why not say goodbye to the conventional tube lights. Switch to Smart, Switch to Orient LED Batten.